The Energy Star-rated contemporary house at 76 Spectacle Lane sits on a 2.83-acre level and sloping property in a secluded woodland setting. WILTON — The owners of the Energy Star-rated contemporary house at 76 Spectacle Lane have an embarrassment of riches living in this nine-room house and in this particular neighborhood. They have the best of all worlds: a house in a secluded woodland setting surrounded by friendly neighbors, seemingly far from everything but really only minutes to a wealth of natural amenities, municipal parks, cultural attractions, shopping, restaurants and transportation. And while their property is entirely in Wilton, they are very close to the town of Ridgefield, and take advantage of Ridgefield’s long list of events and offerings, especially the new Ridgefield Playhouse, Aldrich Contemporary Art Museum, and free concerts at Ballard Park twice a week in warm weather months. Wilton has its own attractions, many of which this family also enjoys. They live within a stone’s throw of the Woodcock Nature Center, Millstone Farm, and Quarry Head Park — all within walking distance. They are also close to Whipstick Road Open Space and Weir Farm National Park. Also nearby are Harrison Smith Preserve, Millstone Road Open Space, and the Wilton Town Forest. While it’s nice to have so many natural protected spaces and hiking trails nearby, the residents of this house need only look out their energy-saving, Anderson 400 series windows or step out their doors to enjoy their own private woodland surroundings. In fact, the current owners said this setting is so private that they can have breakfast on the deck in their bathrobe. In summer months “when the leaves come out we can’t see the neighbors, but we know they’re there is we need them,” one owner said. This 3,133-square-foot house is located down a very long driveway on a level and sloping property of almost three acres, and there are no unsightly utility poles and wires to obscure the view. The property is dotted with large boulders and rock outcroppings; a reminder that in this area of Wilton and in Quarry Head Park granite was cut in the early 19th century for building materials, including the steps of Wilton Town Hall and St. Mary’s Church in Norwalk, according to the municipal website. The current owners selected this location and constructed this house, so this is the first time since it was built in 1986 that the house is on the market. They have made many updates through the years. They have remodeled all the baths and the kitchen, installed a snow plow resistant mailbox, added a water treatment system and expanded the septic system capacity. Every door and window was replaced and in 2014, they repaved the driveway. And that’s only a partial list of the improvements. From that driveway, which opens to provide ample parking, a slate path leads to the covered front entrance. The door opens into the two-story foyer. Inside, the formal living room features a vaulted ceiling, gas fireplace, and a door to the wrap-around deck. The formal dining room is open to the living room and features French doors to the same deck. The great room comprises the kitchen and family room, where there is a red brick fireplace, wet bar, and built-in bookshelves. Sliding doors access the deck in the eat-in section of the kitchen, which has a center island/breakfast bar, built-in desk area, and stainless appliances. The optional first floor fourth bedroom is currently enjoyed as a home office with built-in bookshelves. On the second floor there are three bedrooms including the master suite. The partially finished, walk-out lower level offers a huge game or play room with pot belly stove and sliders to the yard, an exercise room, a 200-bottle wine cellar, and an abundance of storage. 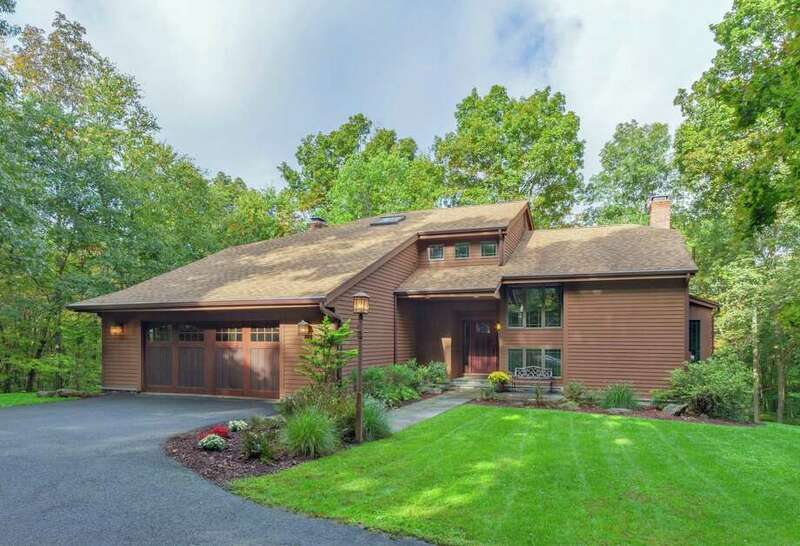 There will be an open house on April 13, 1 to 3 p.m. at this house and a handful of other contemporary-style houses in Fairfield County at the same time, including four houses in Weston — 15 Skylark Lane ($750,000, Susan Leone of Higgins Group), 18 Curiosity Lane ($565,000, Susan Leone), 17 Richmond Hill Road ($685,000, Marilyn Parker of Camelot Real Estate), and 112 Birch Hill Road ($899,000, Cynthia Melchiorri of Coldwell Banker Westport Brokerage) — and one in Wilton: 30 Chessor Lane ($829,000, Susan Larsen of William Raveis Real Estate). For more information or to make an appointment to see the house contact Susan C. Leone of Higgins Group Real Estate at 203-209-2075 or susan@susanleone.com.